The James E. Nichols residence designed by C.P.H. 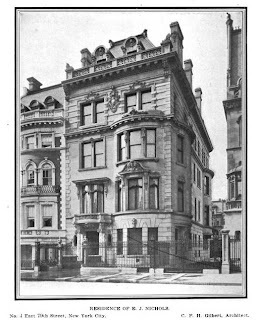 Gilbert c. 1900 at 4 East 79th Street in New York City. Nichols was the head of Austin, Nichols & Company, importers of spirits. The Nichols residence was later owned by Joseph Wright Harriman, owner of 'Avondale Farms' in Brookville on Long Island and subsequently by Ogden Phipps from 1938-1946. The house later underwent extensive alterations and after a short lived conversion has returned to use as a private residence. Click HERE for more on the Nichols residence and HERE to see house on google street view. Photo from Architectural Record, 1902. Do we (you) know at what point the bow front was taken off? I would be interested in seeing a before and after floorplan. Moving the entrance hall wouldn't be a small undertaking on a house of this caliber. Is the architect for the renovation known? The later enlarging of the Mansard roof was not very sensitive, but the centering of the entrance and removing the front bow produced a less eclectic, and in my opinion, better house. Like the classical facade renovations but the boxy and overscaled mansard is indeed unfortunate. The house is lucky to be on one of the most beautifully intact blocks of townhouses on the upper East Side. Stretching from Fifth Ave to Madison, between 78th and 79th Streets, there is quite a collection of architectural styles and designs. The Fifth Ave frontage anchored by the spectacular Isaac Fletcher mansion at 79th (also by CPH) and the Duke mansion at the 78th, is particularly wonderful. Much calmer and more organized facade after renovations, but WHAT is going on with that roof?